Meet the new Space Lens update to CleanMyMac X! CleanMyMac X 4.4.0 "Space Lens"
We’re excited to announce that Space Lens is out of beta! We’ve been working on it for a while and done our best to bring it to perfection. Your feedback helped us a lot, so we can’t thank you enough. Space Lens got a completely new look, more intuitive interface, and smooth animations. Let’s dive in and see all the perks of the brand new module! Space Lens is all about space exploration. When working on your Mac, you accumulate lots of stuff: downloads, pictures, podcasts, documents, archives, and whatnot. You may not even know about all the files you store. Therefore, if at some point you wonder where your disk space has gone, the new CleanMyMac X module will help you to answer this question. 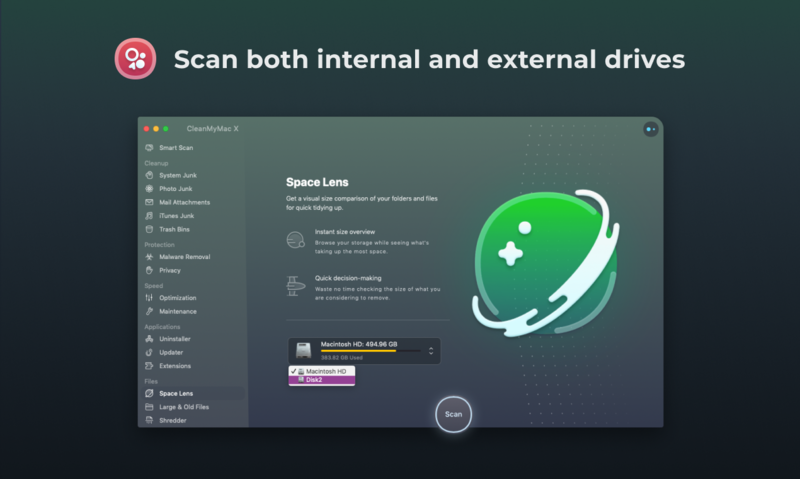 Space Lens allows you to build a detailed map of your drive — cosmically beautiful and easy to use. 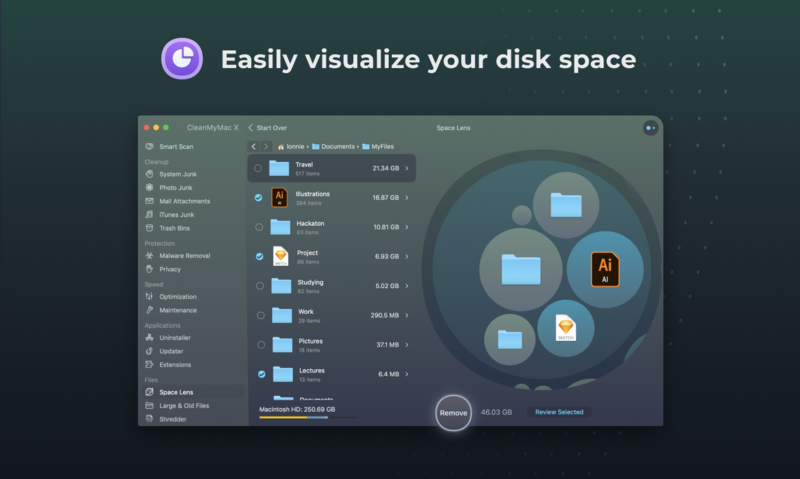 All your files and folders are displayed as bubbles of various size, and the bigger the bubble, the more disk space it takes. Captivate yourself with this satisfying way of hunting down space wasters on your Mac! Once you scan your disk and build your storage map, you can see what’s taking up the most space. Review the uncovered files and delete those you don’t wish to store anymore. 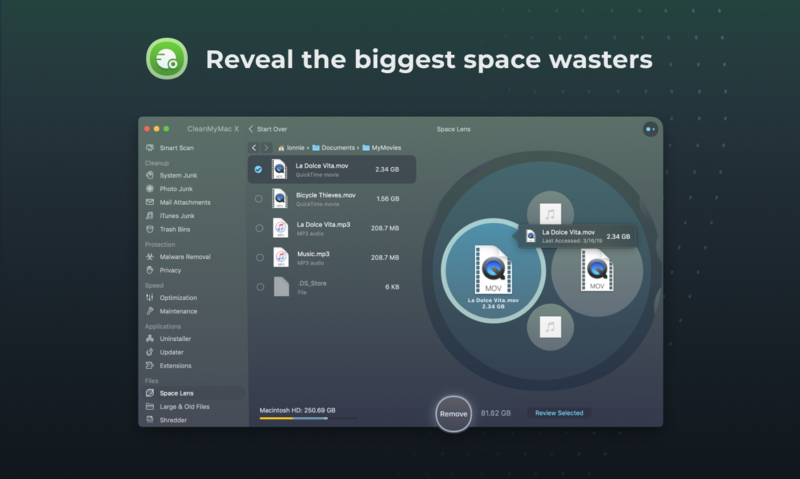 Waste no time checking the size of what you’re considering to delete — Space Lens will show the size of all files on your Mac. When deleting files, you may not worry about wiping out the wrong ones. The essential system files are protected and you can’t select them for removal. With Space Lens, safe cleaning is guaranteed. Space Lens can also analyze your external hard drives or USB flash drives. Just choose the volume you want to scan and build its storage map in a matter of seconds. No big baddies will hide from you! We can’t wait for you to try out the new Space Lens. With its help, revealing space hoggers on your Mac is easier than ever. Update your CleanMyMac X to the latest version and see for yourself! If you don't have the app yet, download CleanMyMac X here. P.S. If you have any suggestions on how to improve this module, let us know at once. And don’t forget to bookmark our What’s New page — here you’ll find the latest updates to CleanMyMac X, as well as things we’re currently working on.